Thank you for visiting Just4Kicks Boston, a unique website aimed at helping soccer players and their families better understand the dreaded ACL tear. Here you will find educational content on topics like the anatomy of the knee, mechanisms of ACL injury, different risk factors that can predispose you to an ACL tear, and various prevention strategies to help mitigate your risk of injury. Blog posts and video content will be added frequently to help educate you on what you can do to reduce your risk of ending up on the sidelines. Starting in Spring 2019, Just4Kicks Boston will be taking on new clients for individual and group soccer-specific Return to Sport or ACL Injury Prevention training sessions. The purpose of these sessions is to hone different soccer skills, but more importantly, teach athletes how to move safely and efficiently, so that they can continue to perform at the highest level. While the risk of any injury cannot be completely eliminated, these sessions will reduce each player’s risk of ACL rupture, while also enhancing his or her performance on the field. 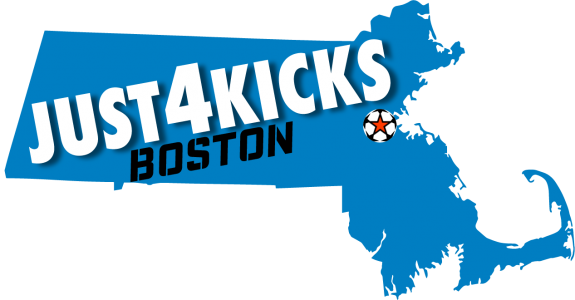 Referral Program: Receive one complementary training session for every teammate you refer to Just4Kicks Boston. Would your soccer team would benefit from an educational lecture on ACL injury prevention? Do you live within a 50-mile radius of Athletic Evolution? This site was founded on the core values of ‘giving back’ and ‘doing good.’ As such, Just4Kicks Boston will continue to provide pro bono educational lectures to all teams or clubs located within a 50-mile radius of Woburn, Massachusetts. E-mail contact@just4kicksboston.com to set up your free 60-minute ACL injury prevention lecture today. For a limited time only, purchase Just4Kicks Boston gear by visiting the New Balance team store here! When an athlete enters through the doors of Athletic Evolution, they feel like they’re stepping onto a college campus, where they have every training resource at their disposal. From 7,000 square feet of artificial turf, to 7 Olympic lifting platforms and 8 squat racks, to state-of-the-art Keiser and Vertimax equipment, AE has everything to take any athlete to the next level. Athletic Evolution has been the official Nike SPARQ Training Center of the Northeast since 2008. AE Physical Therapy is reinventing the way to go about recovery and injury prevention through the use of cutting-edge technology. We are a fully-functional physical therapy facility that is athlete-focused with the primary goal of getting you back to play the sport you love as quickly as possible. AE Physical Therapy has direct contact between trainers, therapists, and insurance companies so there is no disruption in communication. Our goal is to make your rehabilitation process as seamless and quick as possible. We strive to assess patients within 48 hours. Contact us today to set up your initial evaluation.